I got a new toy. 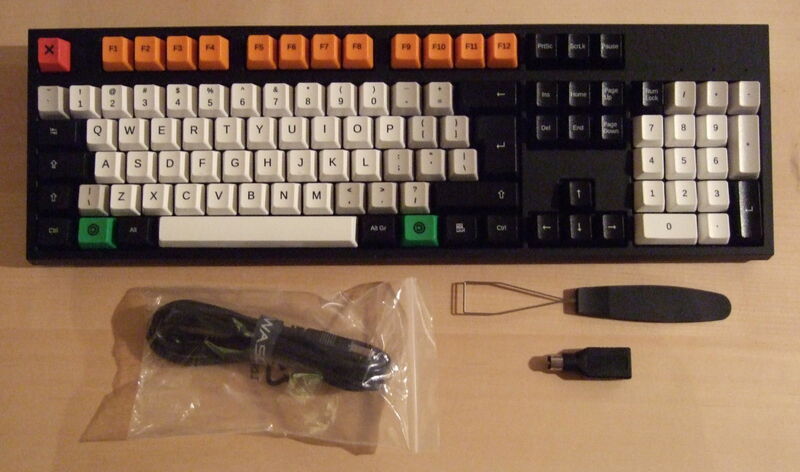 It’s a WASD keyboard with Cherry MX Clear switches. The picture doesn’t do it justice; maybe I should’ve gotten a new camera instead… I guess it’ll have to wait. Mechanical-switch keyboards are pricey, but since I spend more than 2000 hours a year in front of a keyboard, it’s not a bad investment. Or so I’m telling myself. Anyway, it’s a big step up from the rubber dome one I’ve been using for the past couple of years. The key travel is longer, and it’s nice to have proper tactile feedback. Since the Clear switches have stiff springs, I can also rest my fingers on the keys when daydreamingthinking. It has anti-slip pads underneath, so it stays put, and it doesn’t bounce or rattle at all. Until our last move, I clung to an older, clicky keyboard (I don’t remember which brand — I thought it was Key Tronic, but I’ve a hard time finding any clicky keyboards of theirs at the moment), worried that the future held rubber dome and chiclets only — but today, there are lots of options if you look around. I guess we have mostly gamers and aficionados to thank for that. So thank you, gamers and aficionados. I did plenty of research beforehand, but WASD finally drew me in with this little detail: They have some very well thought-out editable layout templates for SodipodiInkscape. Good taste in software there.